On April 15, 1949, a new kind of radio station appeared on the airwaves. Pacifica Radio was founded by Lewis Hill, a pacifist who believed that radio stations should be funded by listeners, not by corporate sponsors. The first station was KPFA in Berkeley, which still serves the Bay Area. In 1959, sister-station KPFK came on the air in Los Angeles. Other Pacifica stations exist in New York, Washington and Houston. For years, KPFK’s powerful signal was heard in San Diego at 90.7 FM. 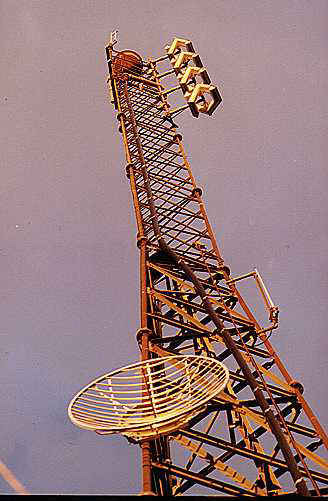 Then in February 2000, a new station began broadcasting from Tijuana on the same frequency, non-commercial classical music station XLNC. Both stations interfered with each other and listeners had to put up with the noise and static. It seemed curious that two such valuable, listener-supported radio stations had been assigned to the same frequency where interference was inevitable. Last year, XLNC in Tijuana moved to a new frequency (104.9 FM), so San Diegans can hear KPFK once again (as well as XLNC’s classical music without the “swishing” noise). For new listeners, KPFK offers a variety of alternative programming that they will not hear anywhere else on the radio dial in San Diego. For long-time residents, we can get re-acquainted with this valuable media resource. Now, sixty years later, we in San Diego are able to hear KPFK once again. KPFK is that little signal sandwiched between Z-90 and 91X FM, at 90.7 FM. Their transmitter on Mount Wilson (near Pasadena) puts out one of the most powerful signals on the west coast. Here in OB, the signal comes in most of the time on a good radio, but it can be hard to hear on an inexpensive portable radio or one without an antenna. It can also fade out in bad weather. 1) Use a good quality FM radio, like a stereo receiver or a good tabletop or portable radio. Car radios usually work well. Inexpensive personal stereos might not be able to get the signal. 2) If you have a TV antenna on the roof, you can use a splitter and connect it to your FM radio. VHF TV antennas usually work pretty well for FM. From OB, the compass direction to Mt. Wilson is about 335 degrees, so aim the antenna a little bit west of Bird Rock as a starting point. 3) If you don’t have a roof antenna, “rabbit ears” work pretty well for FM. Use the cheapest set of rabbit ears, they don’t need a tuning knob or a UHF loop. Adjust each element to 30 inches long. If possible, place the rabbit ears near a north or west facing window. Connect the rabbit ears to the FM antenna connection on the radio. Move the rabbit ears around until the signal is clearest. 4) A wire FM Dipole antenna will work instead of rabbit ears. The wire dipole is easier to hide but harder to adjust. Wire FM dipole antennas can be bought at Radio Shack (Model: 42-2385), Fry’s or most electronics stores. 5) If you are using a radio that plugs into a wall outlet and does not have an external antenna connection, try moving the power cord around for the clearest signal. 6) If you tune in 90.7 and all you hear is a mixture of different stations at the same time, your radio is probably getting overloaded by the strong stations on Mount Soledad. That means you are getting too much signal from other stations that are wiping out the station you want. That is a common problem in OB, and it means the antenna might be too good for the radio. If the radio uses a whip antenna, try lowering the antenna. Otherwise, try using a different radio. Interesting – I’ve caught some good programming on Pacifica when up in the Bay Area, especialy around election time last year, wasn’t even aware a signal was available down here. Thanks for the tip! and thanks 104.9 for changing frequencies!